After tearing through its three-game gauntlet and then Rutgers, the Michigan football team is feeling as good about itself as it has in a very long time. There’s a different feel about this team and the 2016 team that fell apart in the final two weeks of the season. That confidence is also showing on the recruiting trail, especially after the last two game day visits against Penn State and Wisconsin where the staff welcomed two impressive groups of recruits to campus. Over the summer, there were plenty of questions about not only Jim Harbaugh’s record at Michigan but also his recruiting. After signing the #22 class in the country in 2018 and the addition of some lower ranked commits in the 2019 class, fans were wondering where the elite talent was. Boy, have things changed. 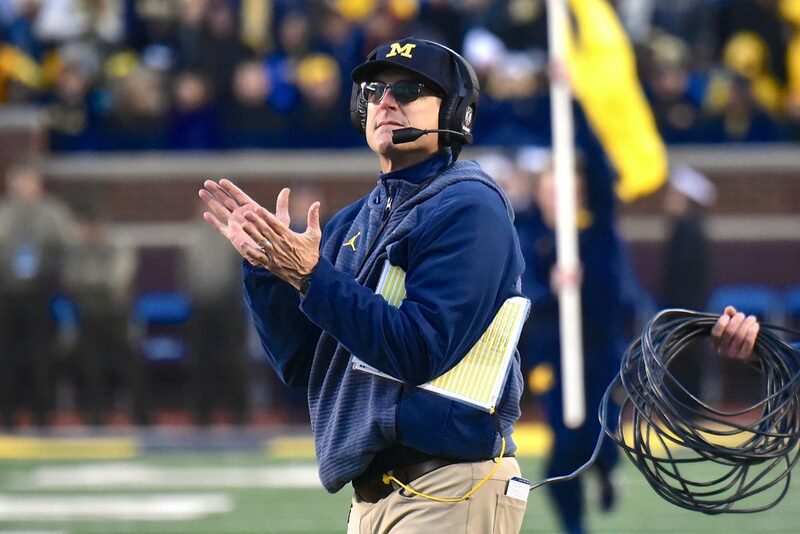 Today, Michigan has the 9th ranked class in the country and tops in the Big Ten after adding five-star S Daxton Hill and the dynamic duo of SR Giles Jackson and ATH Mike Sainristil this fall. And that’s just the start of it. If Michigan knocks off Ohio State on November 24th, it may not be the only win for the Wolverines over the Buckeyes this month. That’s how well things look to be going for UM in the heated raced for the #5 player in the country. 247Sports’ Steve Wiltfong has consistently been hearing the Wolverines being a top two option for Harrison and now following the latest unofficial visit, his sources in Ann Arbor are now confident in Michigan’s chances ($). The national recruiting analyst switched his Crystal Ball from Ohio State to Foggy with Michigan possibly being the next move and it could be followed be plenty of others. Well, those Crystal Balls have begun coming in, mine included, as the good news continues to roll in for Michigan. TMI’s Steve Lorenz broke down why he put in his prediction, focusing on the impact Linebackers coach Al Washington has had in this recruitment ($). Wiltfong waited to put his Crystal Ball in until getting as much information as possible. That information came available following Michigan’s blowout of Penn State and Ohio State’s nail-biter against Nebraska. But even with more positive news for the maize and blue, he can’t completely count out Urban Meyer and the Buckeyes ($). This recruitment has reached the level that I would be pretty shocked if he didn’t end up at Michigan. Question is, could it happen soon? The early signing period is just over a month away and with him planning on enrolling early at his school of choice, a decision is expected by then. There’s still time left but barring a huge change in momentum, he should end up being one of Michigan’s best recruiting wins of all time. The longtime top target for the staff in this class, Crouch would be another huge win for this staff. And it’s starting to look like that just may happen following his official visit for the Penn State win. Michigan has long been a dark horse in this race. National analysts never truly named the Wolverines a contender as the SEC’s power, Alabama, and the Carolina programs, Clemson and South Carolina, looked to be the best bets. That was even after Crouch made two unofficial visits to Ann Arbor on his own dime, had called Michigan the #1 team on his list as recently as mid-October, and the only negative thing he ever mentioned about the program was the cold weather. It didn’t help when Crouch unofficially visited Clemson for the Florida State murder at the end of October. That trip resulted in several Crystal Ball selections coming in for the Tigers, including 247Sports’ Steve Wiltfong. But that prediction was far from being put in stone as Wiltfong admitted to sleeping on UM in this race heading into Crouch’s official to UM ($). That was likely a good call as things clearly went just about as good as possible during Crouch’s official visit to Michigan with his mother and grandmother by his side. TMI’s Steve Lorenz felt like it was very possible that Michigan would lead after the visit and he was right. The main hurdles for UM looked to be a first look at the cooler weather and his mother and grandmother’s approval. Well, according to Lorenz, UM was able to win them and Quavaris over during the trip ($). His partner in crime, TMI’s Sam Webb, is also hearing that the Wolverines are in the driver’s seat thanks in part to the impact Crouch’s former head coach and mentor, Sam Greiner has had on his recruitment ($). Regarding Crouch, if he was signing tomorrow, I would bet he chooses Michigan but if he was signing in January, which he is, my bet today would be on Clemson. In other words, I’ll roll the dice on Clemson in the long game. But I don’t foresee making a Crystal Ball prediction until after his Clemson official and likely not until after in-home visits in December. Crouch has mentioned several times about silently committing to his program of choice and then announcing that decision at the All-American Game so he can enroll early. That’s why those in-home visits will be so huge. It’ll be each coaching staff’s final chances to pitch Crouch and his family. The #28 player in the country also visited Tennessee this weekend but even with the win over Kentucky, the struggles for Jeremy Pruitt in his first year looks to be too much to overcome in this race. While the proximity to Clemson and the strong religious beliefs of Dabo Swinney are attractive to Crouch, I believe the close connections with the staff and players at Michigan can win out here. But there’s no such thing as a sure-thing in the recruiting game. That still doesn’t mean I won’t have him on my upcoming Best Guess Recruiting Class. Karlaftis has been committed to Purdue for more than a year but he may be a pledge everyone will be paying attention to heading down the stretch. Bobby Petrino has been fired by Louisville and all eyes are on former Cardinals quarterback and current Boilermakers head man Jeff Brohm. There’s nothing more to this than rumors and stories at this point but if Brohm were to take the Louisville job, Karlaftis instantly becomes a player to watch. He’s mentioned multiple times in the past that pretty much the only way he’d end up elsewhere is if Brohm were to take another job. And Michigan is the team he’s consistently talked about if that were to happen. With the Louisville job officially open, things could start to get very interesting. Unless Purdue somehow losses out and misses a bowl game, a move looks unlikely to happen prior to the early signing period (December 19th) so will the Brohm rumors keep Karlaftis from signing early with the Boilermakers? He’s reportedly set to enroll early which is normally around late December/early January, right around when most coaches are getting new gigs. On top of continuing to have a ton of great things to say about a program he isn’t committed to, he also didn’t rule out a visit to Ann Arbor prior to signing when asked by Marich. As this cycle comes to a close, this is another one to watch closely. If Brohm stays, it’s hard to see Karlaftis changing his decision. But if Brohm bolts, you have to like Michigan’s chances at the flip. If the staff is able to sign Harrison and Crouch, to go along with DT Chris Hinton and S Daxton Hill, that would be 4 five-star recruits for 2019. And that doesn’t even include the possibility of Karlaftis or current commit RB Zach Charbonnet, who very well could (and should) end up with a five-star rating by National Signing Day. To put that into perspective, Michigan has signed just 5 five-star recruits in total since 2013, has only signed more than 2 five-star recruits twice in one class (2001 and 2017), and has never signed more than 3 five-star recruits in a single class during the online recruiting rankings era. So, it’s safe to say this could be an all-time haul for the program. Dare I even say this could be Harbaugh’s own “Fab Five”? Not a five-star but one of my favorite recruits left on the board is the four-star Florida State commit out of Georgia, 2019 LB Kalen DeLoach. DeLoach is a player I felt like would be a perfect fit to replace Devin Bush Jr. in the Michigan defense and though the staff was pitching him on being just that, he committed to Florida State and the Harbaugh’s close family friend, Willie Taggert, at the end of July. But that didn’t stop UM and LB coach Al Washington from continuing to pursue the tone setting linebacker. That pursuit (and an assist from the struggles for Taggert and FSU) clearly paid off as DeLoach made an official visit to Michigan for the Penn State game. And just like with Crouch, that trip clearly went as well as possible. That full scope recruitment that includes the entire program caring about the person, not just the player, is something that continues to set Michigan apart in their pursuits of priority prospects. But is it enough to sway DeLoach away from the Seminoles? 247Sports’ Keith Niebuhr is hearing good things about Michigan’s chances following the visit as his sources don’t believe his commitment to FSU is that solid ($). Auburn is still in this race as well and no one is counting them out just yet. But at the same time, that’s another program that could be making a coaching change this offseason. Either way, I like where Michigan sits in this recruitment heading into crunch time. Along with DeLoach, other top four-star targets to watch heading down the stretch includes OT Trevor Keegan, who I’ve had in my BGRC for a while now and continues to point towards Michigan, and WR Cornelius Johnson, who has one of the best wide receiver senior tapes in this class and just set his official visit to Ann Arbor for mid-December ($). There are two other four-star targets that may be falling down or off the board if official visits aren’t set up. WR Kyle Ford looks like he may stay out west for his college ball and fellow California standout TE Isaiah Foskey is trending towards playing defensive end for Notre Dame. Bailey, unfortunately, broke his collarbone in the last game of his junior season. That held him out of visiting Michigan for the Penn State game, which would’ve been his second gameday visit of the season. There were plenty of rumors out there that he could potentially drop to the Wolverines during that visit but even with the cancellation an upcoming decision doesn’t look to be out of the cards. My Crystal Ball is on Michigan here and barring something big, he’ll headline my first 2020 class prediction (which will be out in the near future). The elite tackle and little (bigger) brother of 2019 commit DT Chris Hinton, Myles made another visit to Ann Arbor for the Penn State game. Stanford is a big threat here but signs continue to point towards him following his brother to Michigan. By the way, he may end up fighting for the top overall spot in this class by National Signing Day 2020. He’s that good of a prospect. Though he dropped down the rankings a bit over the summer and early on in his junior season, Mullings continues to be a priority in this class. He also visited for the Penn State game and had nothing but amazing things to say about the Wolverines. This looks to be another Michigan-Notre Dame battle that could go either way. There’s still plenty of time to go in this recruitment but Michigan has set themselves up nicely here. Rogers got plenty of attention when he didn’t include Michigan in his top 13 list early on in his recruitment after the Wolverines finished the 2017 season on a sour note and Tim Drevno was on his way out the door. Things were going nowhere fast with the in-state program while Georgia looks to be the favorites to land him. Fast-forward to today, Rogers has now made multiple visits to Ann Arbor and has begun growing a strong bond with Jim Harbaugh, Ed Warriner, and Pat Kugler. Georgia still looks to be atop his board but if more visits happen, this could be one to pay closer attention to with more than a year left in the cycle. The Broken Arrow (OK) teammates, Raym and Slusher were originally scheduled to make it to town for the Penn State game but were unable to make the trip. And though the Big 12 programs are the early favorites here, Michigan is in the thick of things. There’s still plenty of time to go here and it’ll be tough to pull top talent away from the Sooners but it’s not like the staff didn’t just do that with 2019 S Daxton Hill. Early on, I like Michigan’s chances with Slusher better than Raym but both are legit options for this class. Williams is one of the top receivers in the class and another big-time recruit out of Detroit. He wasn’t shy about his love for Ohio State early on in his recruitment but as his junior season has gone on, Michigan has been making a move. And now thanks to his visit for the Penn State game, the Wolverines may be in the driver’s seat as 247Sports’ Midwest analyst Allen Trieu has put in his CB for UM after speaking with Williams. Paige is the top-ranked safety in the state and one of the best in the Midwest. He’s made multiple trips to campus, including two game visits this season. If he remains a top priority for the staff, I like Michigan’s chances of adding the West Bloomfield standout. As TMI’s Steve Lorenz mentioned, OT Kevin Pyne has reclassified from the 2020 class to the 2019 class. It’s unknown where things stand for Michigan with the move as there isn’t much room left in their current class, especially on the offensive line. I flipped my Crystal Ball to Notre Dame as the Fighting Irish has looked to be on top early on in his recruitment. Michigan offered 2020 Muskegon (MI) ATH Cameron Martinez on Sunday and it is another one to watch. Martinez is a two-way star player that could play multiple positions at the collegiate level. 247Sports’ Allen Trieu already has his CB in for Michigan. 2020 Monsignor Pace (FL) CB Jaheem Joseph made an unofficial visit to Michigan for the Penn State game and is clearly feeling the maize and blue. Joseph told WolverinesWire’s Evan Petzold that Michigan is tied at the top of his leaderboard following the visit ($).